The carved stone arch (Ref A on the plan) over the doorway through which you enter the church is one of Its oldest surviving features; it dates from about 1180-1190. So does the main body of the church, its walls and the outer eight of its ten large columns (B): probably also the font (C) used then as now to hold the water for baptisms and the stoup (D). All these are made of stone, which was in good supply in Rutland and that has been Important for their survival. This is especially true for the stoup which stood in the porch; it held holy water, the use of which was a practice which came under great attack in the religious upheavals of the 1500’s and 1600’s. Very few ancient stoups now survive and this one may have been buried outside in the churchyard to keep it safe in those troubled times. In 1180-1190 the church was probably much darker inside than today. The upper windows (the Clerestory) were not added for another 250 years or so. just after Oakham church was built. 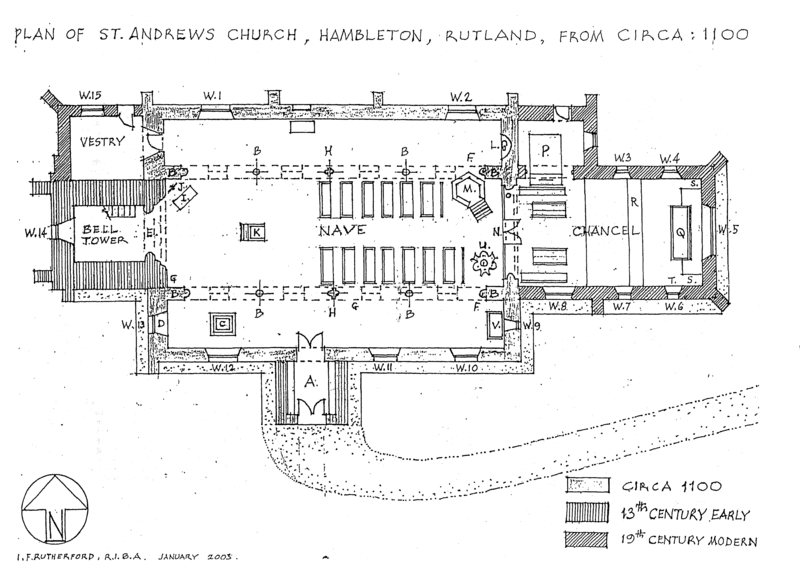 But the columns show that the building was already substantial How did Hambleton come to have such a building? Part of the answer lies in the overall history of England. In much of England in the 1100’s there was a surge of church and civic building. The Norman kings and barons had consolidated the hold over England which William the Conqueror had won by defeating Harold and the Saxon army at the Battle of Hastings in 1066. The pillars, arches and doorways of a similar in design to those here are to be found in other Rutland churches from the same period; the Great Hall of nearby Oakham Castle was built at this time. The other part of the explanation for a substantial stone church being built in Hambleton towards the end of the 1100’s lies in us location at the top of a steep hill overlooking the fertile Vale of Catmose. This natural vantage point has been a place of human habitation since at least 600 AD (and probably also of religious worship and of burial). The great Norman survey of 1086, Domesday Book, and other records, show that by Saxon times, i.e. a thousand years and more ago, Hambleton was the major settlement of the area we now know as Rutland. The hill top community held a commanding position in the centre of this area and it was the senior village in a grouping of seven. Its “manor”, i.e. principal lands, was in royal hands as part of the dowry (marriage lands) of Aelfryth, mother of the Saxon King Ethelred (known as the Unready). It was then in the hands of Emma his wife and later of Edith, wife of King Edward (known as the Confessor). Edith’s Rutland connections live on today, in the name of the village Edith Weston, now divided from Hambleton by Rutland Water. In King Edward’s time the church in Hambleton was important enough to be the mother church of St Peter’s Church, Stamford; and only a little while later Domesday Book records as many as three churches as attaching to Hambleton – all the more remarkable, since only four Rutland towns or villages are recorded as having churches at all (the others being Oakham, which was rebuilt 200 years later, Whitwell and Ridlington). We can now only guess what our Saxon church looked like. We cannot even be sure that it was then known as St Andrew’s. “Andrew” possibly being a corruption of the old English “Audrey” or Etheldreda, a popular saint in eastern England, of royal blood related to Edmund, King and Martyr, patron saint of the church only a couple of miles away down the hill at Egleton. By Norman times, however, St Andrew was firmly established as the church’s patron saint; his is the name in several accounts which tell us that, by royal direction, Westminster Abbey in London held the power to appoint the priest in charge at the Hambleton church. “Albert the Lotharingian clerk” is the earliest recorded priest at the time of the Domesday survey, i.e. about 100 years before the 1180-1190 building. In 1231 the powers and rights attaching to the church, which included a pension of 20 shillings a year from the church of St Peter’s, Stamford, are recorded as belonging to the Bishop of Lincoln rather than to Westminster Abbey; in 1235 the Lincoln Bishop-elect, by name Grostete (“Bighead”) appointed John de Dyham to Hambleton, but reserving 40 marks a year to the Dean and chapter of Lincoln. You can see John’s name at the head of the List of Incumbents (O). John was the “incumbent”, the official priest for the whole parish of Hambleton. He was not the only priest in the group of villages which made up the parish. It is likely that there was a junior, assistant priest. In addition at least one household in the village had its own chapel and priest. Records survive which show that the Bishop of Lincoln gave a license to a John Talbot of Lower Hambleton for a private chapel but he had to pay dues once a year to St Andrew’s. He and his family had also to attend St Andrew’s services on Sundays. Around this time, i.e. in the early 1200’s, the tower was built. The church will have started to look from the outside much as it does today, particularly from a distance in the valley below. Inside it would have been darker – windows were much narrower than most of those now in place and there was no clerestory. The tall thin “lancet” windows (W9 & W14), now glazed with the “rainbow glass” and “St Martin” date from the early 1200’s, but none of the larger windows frame work had yet been made, let alone the glass that we see today. Following the building of the tower, little of what happened in the next 200 years has left a major mark on the church that we now see. There was a re-building, probably in the early 1300’s, when windows were added at ground level on the North side – the exact position of which was adjusted in a later reconstruction. Essentially the North aisle stone window tracery, the frame work (W1 & W2), are still those of the 1300’s. From this time to date various pieces of carved stonework, in particular the sedilia (triple stone seating) and piscine (basin) (T) in the Chancel, two coffin slabs (F) with incised crosses at the front of the Nave and two coffin lids (G) one of a man and one of a woman; these are believed to have been benefactors of the church, perhaps the man was Lord Bodlesmere, who in 1315 as “Lord of the Manor of Hambleton” had an official permit to hold a weekly market and an annual fair in August. At this time the village stretched not only along the top of the hill as Upper Hambleton (as it is still known on maps) but down the hill as Middle Hambleton and beyond to The Old Hall (Jacobean) and across the Gwash as Nether Hambleton which is flooded by Rutland Water. Markets and a fair and benefactors suggest that Hambleton continued to be a village of some wealth, but perhaps less than previously. There may have been other strains and stresses too. There were renewed squabbles between Lincoln and Westminster as to which of them had the better title to St Andrew’s and the lands that went with it. There was a high turnover of priests in the mid 1300s. At some date, quite possibly from this period, some of the other Rutland villages which had been subsidiary to Hambleton became independent. In addition, in 1349/50 Hambleton was hit by the Black Death, a devastating outbreak of bubonic plague in which many towns and villages lost upwards of half their inhabitants, a human tragedy with major economic consequences. About 50 to 100 years after the Black Death and still some 600 years before our own time, i.e. in the first half of the 1400’s, there were major building additions to St Andrew’s. The centre of the Nave roof was lifted and two new pillars (H) of slightly different design to those of 1180/90, one on each side of the church, were provided to carry its weight at the middle. The higher roof provided space for a run of extra high-level windows, the Clerestory. On the South side new windows (W10, W11 & W12) were inserted into the walls. At the east end a major new window the Great East window (W5) was put into the old chancel. None of this chancel remains but as with the earlier North-side windows the stone tracery (framework) of these windows survives today (the stained glass is a Victorian addition). By about 1450, this gave the church the size, shape and light which it has today. We know there used to be an old bell, the Priest’s Bell, which some accounts date 1436, so perhaps that was the date also of the major building work. But these years were not wholly a time of doom and gloom for St Andrew’s. For example, from 1535 we have a record of a local farmer, William Gybbins, rich enough and pious enough to leave money on his death to be invested to pay for candles to light the altar and the body of the church. He was also canny enough to provide for further sums (for candles for a side altar), but only if others in the village would also contribute. From 1558 regular church records, mainly of baptisms, burials and marriages were kept and archived. An Elizabethan silver communion chalice and paten (cover) 1569 was used for the communion service. An inspection in 1570 found everything in good order (though perhaps this was more a matter of morals than of the church fabric – the same inspection criticizes neighbouring Egleton for an un-married mother-to-be and offers its opinion as to the identity of the father (from a village some 10 miles away). The St Andrew’s records and silver still survive today (though no longer kept in the church). In their earlier years were they perhaps kept in the ancient iron bound oak chest (I). Also surviving today is a Bible of 1611 (the great King James or Authorised Version translation) which was chained to an earlier lectern and the bells of 1611 and of 1621 which still ring out from the tower, particularly for weddings and other special occasions. Their (Latin) inscriptions say “Let all things be done to the qlory of God” and “Not the noise but the love sings in the ear of God” and “l ring not to the souls of the dead, but to the ears of the living”. From this period also dates 3 of the pulpit’s carved wood panels (M), though the main construction of the pulpit was made in Victorian times. By 1700 civil war and religious strife inside England had largely ceased. Life in Hambleton as elsewhere was settling down, so much so that in 1750 the church records show that one Richard Watts was being paid 2s 6d a year “to awake people in church”. Was it the length or the content of the sermon that was the principal cause of their falling asleep? Settled times are reflected also in the fact that in a period of over 100 years beginning from 1708 Hambleton had only three vicars, two of whom were each in post for 40 years – not for them the “pitching down the hill” by which Hambleton villagers were said traditionally to get rid of vicars of whom they disapproved. When William Gardiner, the first of these two, died, a fine set of 1749 silver was given in his memory; Robert Tomlinson, the later of the two, is commemorated in the massive “table” tomb beside the porch. The fine set of silver, thought to be the best in the diocese, includes an ornate 36oz flagon, a chalice with paten (cover) and alms dish (not kept in-the church). From these more settled times come the earliest surviving financial accounts (1729) kept by the churchwardens of St Andrew’s – and a little later a sketch of St Andrew’s which is now in the Rutland County Museum in Oakham. In September 1749 a freak tornado struck Rutland, passing close by Hambleton, but apparently leaving St Andrew’s undamaged; certainly a further picture (painted by one Nathan Wilson in 1793 and now also in the County Museum) shows little change. One thing which it does show is the churchyard substantially filled with large tombstones, another sign of settled and comparatively prosperous times, as are the tombstones and memorial tablets inside the church, the majority of which date from this era (look for memorials to Hippisley, Gardner, Jackson). In 1832/3 more restoration work was carried out. It seems likely it was substantial both inside and outside. There is (in Uppingham School library) a water colour picture of 1838 in which, for example, the weathervane on the top of the tower, the detail of the South aisle west window (W10) and the detail of the door to the porch all differ from what is shown in the two earlier pictures. All these may date from the restoration of the early 1830’s. when also the coffin lids may have been brought in from the churchyard and several of the tombstones set into the church floor re-laid. The 1830’s weathervane (J) appears to be the weathervane which was in use until 1936 and the surviving fragment of which is now kept in the church. Further work to maintain or extend the fabric and the interior furnishings of St Andrew’s continued throughout the 1800’s: a new tenor bell in 1837; new seating in 1847, since replaced ; a vestry in 1856 (which now houses the organ); restoration of the tower and re-hanging of the bells in 1861. All this was from the resources of a modest village (for that is what Hambleton had now long been). There was no big house or grand family (if those were what you wanted, you needed to go to Burley or Exton); Hambleton Hall was not yet thought of and Hambleton Old Hall had for years been let to tenant farmers, the owners choosing to live at Lyndon across the valley. In 1876 just three houses were listed in Kelly’s Directory as Private Residences – those of John Jackson (the Manor House), of Rev’d William Jackson, the curate, (who may have lived at the Priest’s House) and of Rev’d James, recently arrived at the Vicarage in Hambleton after a career in the chaplaincy of the Bengal Presidency. Only one of the various other village churches in the neighbourhood Braunston was still linked with St Andrew’s. The value of the combined appointment was a yearly income for Rev’d James of £180. (The Braunston link itself came to an end in 1885). For the rest, in the 1876 Kelly’s Directory 27 “commercial” residences are listed in Hambleton – mostly of farmers and graziers. The total population was just over 300, more than double what it is today. In 1878 John Jackson, owner of the Manor House, died aged 80 in London and the property put up for sale. Walter Core Marshall, a young man from a family with a prosperous brewery business, wanted to make a base for himself in Rutland in order to join his friends at the hunts in Melton Mowbray and Cottesmore; he purchased the Manor House and on its parkland built Hambleton Hall, completed in 1881. He was thus established here when, to mark Queen Victoria’s Golden Jubilee in 1887, St Andrew’s acquired one new Jubilee bell and had one re-cast from the metal of an older bell. We can be sure that he will have contributed to these, but perhaps not as the active patron of village and church projects which he became in the 1890’s. The look of Hambleton and of St Andrew’s today owes more to Mr Marshall than to any other single individual. Beginning about 1892 and working virtually continuously till his death in 1899 he moved or replaced many, even most, of the old cottages at the centre of the village; he built Post Office Cottages and the Old School (the former school stood in the church yard by the gate but the children disturbed the horses at the hunt). He also re-aligned the roads. In the church, working from the designs of the architect J. Lee, he completely re-built the chancel; added a new vestry and a new organ (P) in the previous vestry in two phases (and with help from others) he re-glazed every window with stained glass (W1-W15). There were new wall paintings (Q & U), woodwork (K, U M, N, Q, R, T, U & V), textiles (E, Q & V), menorahs (S) and other furnishings. All these were designed to the highest standards, often In the style of the Arts and Crafts Movement which followed in the steps of William Morris, Burnes Jones and the Pre-Raphaelites and often also incorporating symbols and themes of the “high church” Anglican faith. The first stage of Mr.Marshall’s major works was carried out in 1892 at the East end of the church. The old chancel had probably been built some 600 or 700 years before and possibly altered in the restorations of the earlier 1900’s. It was now wholly demolished and a new chancel was built to the designs of the architect J. Lee, re-using the stone tracery of the Great east window (W6) of the 1400’s, the sedilia and piscine (T) of the 1300s. It also incorporated an intricately-worked iron screen (N) between the main body of the church, Nave and the Chancel altar rails (R). The lectern (U), pulpit (M), litany desk and chair (K) probably also date from 1891 or 1892 – and perhaps also the pair of menorahs (S) (seven-branched candelabra) which share with them elements of Hebrew symbolism. At this first stage there was none of the stained glass or the organ that now create so much of the character of the chancel. However, it was not long before Mr Marshail, in conjunction with Rev’d Young, vicar since 1893, began a second stage of work; he commissioned the artist James Egan (who designed the windows for Birmingham Cathedral and had worked earlier in his career with William Morris) to design stained glass to fill the great east window (W5) and the five other windows (W3, W4, W6, W7 & W9) in Lee’s chancel – the theme being “Victory”, i.e. the victory of Christ over sin and death, a suggestion from Rev’d Young, which fitted with the dedication of the great east window to the glory of God and in memory of Marshall’s parents. 1895 is also the date of the Lady Chapel Murals (V) by Alfred Hemmings, another artist. It was probably at the same time that each of the main altar (Q) and the Lady Chapel altar (V) was adorned with a Reredos, i.e. a painted wooden triple screen behind the altar. That on the main altar is by Egan. His water colour sketch for the glass hangs in the vestry and shows that he planned the screen and the glass together, knowing that the Reredos would obscure the view of the lowest part of the window. The identity of the artist for the Lady Chapel reredos (V) (dedicated In memory of George Gibb, vicar who died in 1893 and was succeeded by Young) is uncertain; some accounts say Egan, others Hemmings. Possibly both are wrong; look for yourself at the style and the draughtsmanship; closer perhaps to Hemmings than to Egan, but distinguishable from the Hemmings murals and the stained glass (also by Hemmings) in the Lady Chapel windows (W10 & W11); differences include the fact that the Reredos paintings are unsigned (the murals are both signed and dated 1895) and the hands of the various figures in the murals and in the Reredos hardly seem to have been painted by the same artist. (W1) the stained glass of the Mocking of Christ by Egan, in the north aisle. (P) the organ, made by Brindley and Foster Ltd of Sheffield with its pipe-case supported by three flying angels. (Q & V) the altar frontals and some of the vestments are believed to be embroidered by the order of nuns, The Sisters of Bethany. Thus by about the end of 1896 St Andrew’s will have been a showcase of late Victorian devotional decoration. Some of that decoration was even richer in detail then than we see today. The village schoolmaster, S C Cooke, was a keen amateur photographer, and some of his surviving work shows that, for example, the south aisle walls which are now plain whitewashed were painted with ornate patterns when the stained glass was first in place. But even today there is a rich variety of architecture, painting, glass, metalwork, woodwork and textiles. The style, like that of Post Office Cottages just across the road from St Andrew’s, is in the mainstream of the 1890’s Arts and Crafts Movement, inspired principally by William Morris and echoing also Pugin, Burnes Jones and other Pre-Raphaelites. All this is thanks to Walter Gore Marshall whose tomb you can see in the churchyard by the gate, marked by its tall lantern-like cross. In the 100 or so years that have followed the death of Mr Marshall there have been no major alterations to the structure or decorations of St Andrew’s. The architect Lee produced a further design in 1905 for a massive rood screen in the arch between the nave and the chancel together with other decorations in the nave; but this was never built. The design may have been commissioned by Mrs Astley Cooper, Mr Marshall’s sister who inherited and lived in Hambleton Hall after her brother’s death; her daughter, Vera, died aged 24 in 1905 and was commemorated some years later, when the carved wooden statue of the Virgin Mary (L) was dedicated in 1912 in memory of both Vera and her younger sister Mary’s baby, Monica Ashworth who died birth in May 1911. We know of no “Visitors Book” for St Andrew’s from the early 1900’s but might have found several famous names in it from the years immediately before the Great War of 1914/18 and from the war years themselves. Mrs Astley Cooper invited to Hambleton many friends and acquaintances from the literary and artistic world of London; the young Noel Coward was her guest not long before war broke out; later, during the war years, she made Hambleton Hall available as a convalescent hospital for injured soldiers and would ask various of her friends to come to entertain them. Thus a production of Hay Fever was put on in Hambleton Village Hall (on the left as you go down the hill from the church) and guest organist at St Andrew’s from time to time was the young Malcolm Sargent married to her niece, then at the start of his musical career as organist in Melton Mowbray. Their daughter who died of polio is buried in the church yard. The war took its toll of Hambleton as of other villages; nearly a quarter of its 240 or so inhabitants served in one capacity or another and these 8 died. After the war the village subscribed for a War Memorial which stands in the churchyard to the right of the path by the gate where their names are inscribed. Whilst the structure of St Andrew’s has been largely unchanged for hundreds of years and its main scheme of decoration remains that of the late Victorians, recent years have seen villagers, individually and collectively, continue to cherish their church. The chancel roof-bosses have been re-gilded; the bells re-hung; the organ restored, the 1611 Bible conserved (in memory of Derek and Eileen Severs), the Victorian textiles have been or are being restored, Victorian bell tower curtains (E) repaired and re-hung on a brass pole (in memory of Derek and Eileen Severs); new heating provided and in memory of Jackie Kirkpatrick widow of the Lord Lieutenant of Rutland, new candelabra lights installed. Four new additions have been designed and made within the village in recent years – a set of 35 tapsetry kneelers, the glass cross on the Lady Chapel altar, new vestments in memory of Christopher Herridge, to match the white and gold Victorian altar frontal, a chasuble, stole and burse and the weathervane on top of the spire outside. The weathervane belongs to the year 2000; its design as a fish both embodies afresh an ancient Christian symbol and indicates the most recent addition to Rutland’s landscape, the reservoir. The same steep hill which drew the Saxons and probably even earlier people to make the site of St Andrew’s a special place over a thousand years ago now draws the eye of the thousands of visitors to Rutland Water to this continuing place of Christian worship.